NetEnt don’t do things by half so when we learned that they would be releasing a slot containing diamond and fruit symbols on the paytable we knew that it wouldn’t be your typical run of the mill classic fruit slot and they certainly haven’t disappointed with their release of the Hit 2 Split video slot. As you will see in this review of the Hit 2 Split slot machine, NetEnt have put a fresh twist on the classic fruit theme by introducing a modern slot with slick graphics (just as they did with their very popular Fruitshop slot and their Stickers slot), a funky soundtrack which will brighten the dullest of days and they provide you with the opportunity to win up to 2,250,000 coins – a sum far too big to shy away from! While many casino slot machines we have reviewed with a classic fruit theme have pixelated symbols and the annoying crunching sounds of gears rotating as sound effects which show their age, it’s a high gloss affair in this free Hit 2 Split slot. 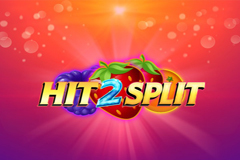 Hit 2 Split boasts bright and vivid symbols filling the reels, glitzy animations which bring glamour to the screen, plus there are even exciting and highly rewarding bonus features to enjoy as you are dazzled by diamonds and sink your teeth into delicious fruits like strawberries and oranges yum, yum! Boasting a structure of 5 reels and 30 adjustable paylines, you can experience the thrill of classic fruit slots with a modern twist from 30p up to £75. If the diamonds and fruits on the reels aren’t enough to entice you then surely the return-to-player percentage of 96.3% will, but if not, there are also double symbols which count as two on a line and a free spins feature where all wins are tripled! The striking symbols on the Hit 2 Split slot machine are so bright and vivid that they are guaranteed to brighten up even the dullest of days with a large pink diamond leading the way as the most valuable of all. Not only is this the Wild symbol with the power to substitute for all but the free spins and double symbols, it will see you rewarded with 250, 1,000 and 5,000 coins for three, four and five on a payline respectively. You’ll also be able to get your five-a-day in thanks to five types of delicious fresh fruits on the reels. Strawberries lead the way as the most valuable of all with rewards worth up to 2,000 coins on offer while oranges are worth up to 1,800 coins, grapes will see you rewarded with up to 1,600 coins, blueberries will see up to 1,400 coins added to your balance, while you’ll be rewarded with up to 1,200 coins for sinking your teeth into zesty lemons. Free spins symbols can appear as single or double symbols and you’ll have the honour of spinning the reels at no cost whenever you land four or more of them on the reels during the same spin. Four see you receive 10 free spins with 2x your stake, five and you’ll get 15 free spins with 2x your stake, six see you scoop 20 free spins with 2x your stake, seven and things get even more exciting as you receive 25 free spins with 4x your stake, while the maximum of eight free spins symbols will see you grin from ear to ear as you are awarded 30 free spins and 10x your stake. As lucrative as this is, there is even more great news to savour. Not only are all winnings tripled in value, it’s also possible to retrigger the feature with additional free spins being added to your counter when you land four or more free spins symbols. Hit 2 Split is powered with software by NetEnt, however it has been exclusively developed for Unibet Group meaning you’ll have to join Unibet Casino or Maria Casino to play it. That shouldn’t be a problem though as there are fabulous bonus offers available at both sites, players can deposit with Paypal, Credit Card and more, plus both sites are safe and secure with excellent reputations.